File formats explained - what are tiff files for? Screen resolution is the ideal format for you to publish on social media or to email to friends or family, you should not print from this resolution as it will be pixelated and frankly only looks good on a screen. Medium is intended for you to use maybe when you are emailing images to friends and family that they will want to print, I wouldn't recommend printing bigger than 10' x 8' to maintain quality. If you intend having your images printed by a high street Lab then this is the format you should give them. Large (tiff), this is the highest quality we provide, this is the file we would print your framed images from in-house. You can print from this file guaranteed to the size of our 'Really big' product about 130 cm x 162cm, you could probably go bigger, but for the sake of safety, we recommend that as the biggest size, which is pretty big! Do not use this file at a high street Lab, their machines strip our information that acts as instructions for professional printers to get the print right. We would also highly recommend you use a professional photographic printer for the Tiff files. 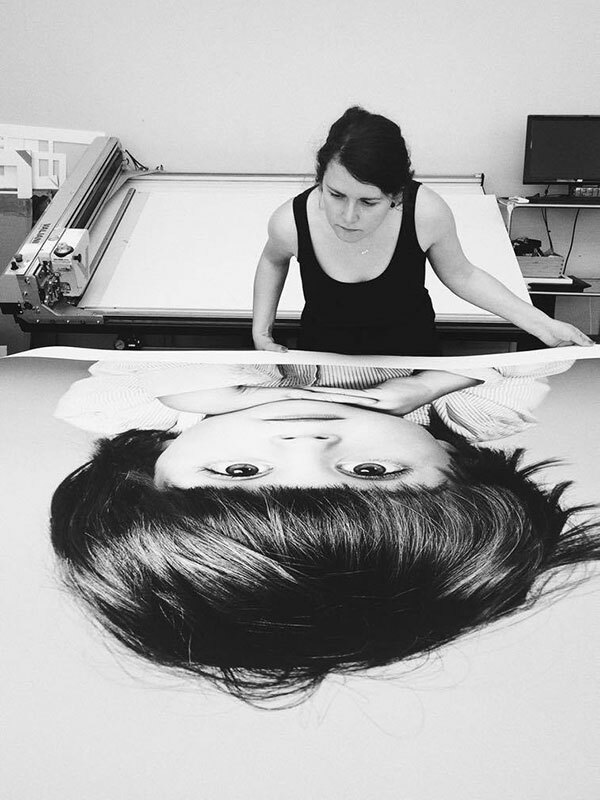 Radostina checking a 'Really Big' image after printing, you'll need the Tiff files to print this big. Can I change my child's outfit during the shoot?